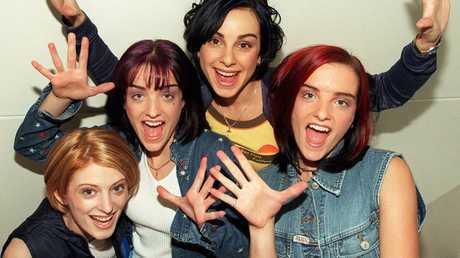 B*witched in 1998, from left to right: Sinead O'Caroll, Keavy Lynch, Lindsay Armaou and Edele Lynch. 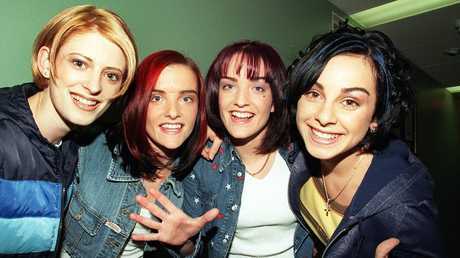 THEY were one of the most recognisable acts to come out of the late '90s bubblegum pop boom: Four wholesome, denim-clad Irish lasses who even worked a Riverdance break into the video for their debut single. B*witched - twin sisters Edele and Keavy Lynch, Lindsay Armaou and Sinéad O'Carroll - enjoyed huge success from the moment they released C'est la Vie, the first of a string of number ones. But behind the scenes, the band was beset by petty jealousy, before a fall from grace so swift it should serve as a cautionary tale to today's pop acts. B*witched, L-R: Sinead O'Caroll, Edele Lynch, Keavy Lynch and Lindsay Armaou. Some people say they look like their dads. 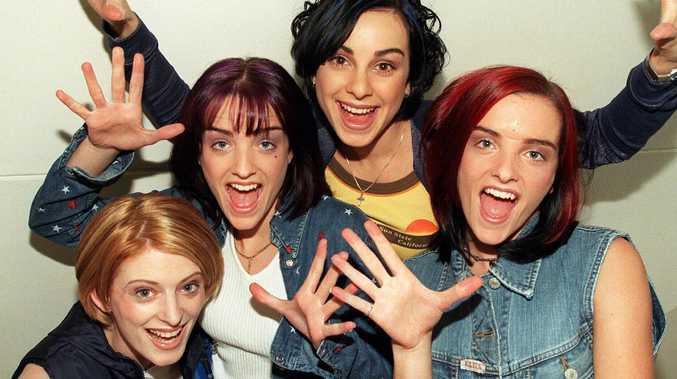 B*witched's unofficial lead singer, Edele Lynch, told all to news.com.au ahead of the now-reunited band visiting Australia next year, headlining the So Pop 90s nostalgia tou r alongside Aqua, Blue and the Vengaboys. The twins' older brother is Boyzone band member Shane Lynch, and for a brief period, they eclipsed his boy band's success: C'est La Vie was the first of four singles to debut at number one in the UK charts. "When we had the first single, we were just looking for a top 20 record. When that went number one - and in a lot of countries worldwide - it was hard to take in, it was so surreal," said Edele. "But when that happened, the pressure started - pressure to make it happen again. Rollercoaster went number one, then so did To You I Belong, then by the time we got to Blame It On The Weatherman (the group's final number one), we kind of didn't celebrate it anymore, it was just how things were. It was difficult to celebrate as you went along, because you were working so hard." For one brief, shining moment, double denim was cool. With her distinctive voice and naturally outspoken nature, Edele found herself pushed to the forefront of the group from the very start. It was a source of constant tension between herself and the others - particularly her twin sister. The focus on Edele was at first borne out of necessity. "We started out on a development deal where the budget was quite low, so they chose who they thought was ahead of everyone else in terms of singing capabilities, and focused on that person - it happened to be me," she said. "I ended up in the studio a lot more, I ended up being pushed a lot more. I had this little twang in my vocals that for whatever reason they just latched on to (it). At that time, the pop market music was flooded, everyone was looking for that one thing that could make them stand out. That, for them, was my vocal." But as B*witched's fame grew, Edele's role as leader began to rankle her bandmates. "As the band got bigger, my role got bigger. Then the other girls, Keavy and Lindsay in particular, just started to feel a bit … left behind, I guess. "I think it was hardest for Keavy, being my twin - it's hard seeing your twin pushed to the front. But all the other girls wanted to sing more." But those group tensions didn't have much time to fester, as B*witched's fortunes quickly faded. That string of number ones ended with Jesse Hold On, the lead single from their second album, which peaked at number four in the UK in October of 1999. Two further singles from the album just missed the top 10. Respectable chart positions today - but a death knell for a pop act in the fiercely competitive late '90s pop scene. "It was really weird," Edele sighed. "That second album (Awake and Breathe) … we sold a couple of million with our first album and maybe a million and a half with our second. "If you sold a record like that nowadays, my god, they'd bite their hand off to sign you and keep you. But in those days …"
Lynch said, looking back, their fate was sealed as soon as they missed that coveted number one spot for the first time. "I remember Jesse Hold On went to number four, and it was all downhill from there in terms of the press getting behind us. It didn't help: At that time they told the public what to listen to, so if they make up their mind about you, it's kind of a given you are on your way out." The rollercoaster ride is over. Undeterred by the muted response to their second album, B*witched got to work on their third - even choosing a lead single, Where Will You Go? They were set to fly to Africa to film a video for the single in October 2001 when they received a call: Both their management and their record label had dropped them. It was all over. "It was hard to deal with. 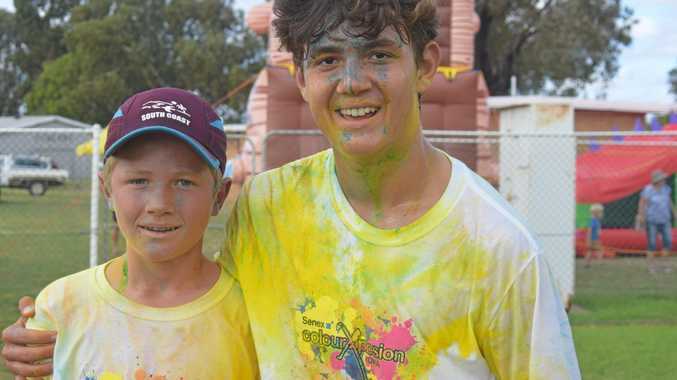 When the whole thing finished and the record company dropped us, that was the toughest time, just trying to figure out what we would do with the rest of our lives," said Edele. "Our lives used to be scheduled for us ahead of time, so suddenly it was: Right. I don't know what to do with myself. I don't even know what I want from the supermarket, because other people used to feed me, you know?" Edele found herself in the unenviable position faced by many a teen pop star, chewed up and spat out by the music industry. She was 21 years old, famous - and unemployed. "You're young and you naively think that it's going to go on for long enough that you won't have to think about what step is next. When you're kind of dropped from a height, it's hard to find yourself. It was really hard to get my head around what I wanted to do next. "I threw myself into writing songs for bands like Girls Aloud and the Sugababes with a company called Xenomania. That kept me from getting to too much of a low," she said. Edele faces off against her bandmates. And that would've been the end of the B*witched story - were it not for a 2013 British reality series called The Big Reunion, which brought together disbanded pop acts to hash out their issues and return to the stage. It made for surprisingly gripping viewing. B*witched were joined on the show by acts including Five, Atomic Kitten and Liberty X, and it soon became apparent many of the squeaky clean pop acts of the early noughties had tales of infighting, affairs and substance abuse to rival Fleetwood Mac. Edele said she was deeply sceptical about the group's foray into reality TV. "It wasn't around in our day. When The Big Reunion was pitched to us, it actually took about nine months for me to say yes. I didn't really want to feel the heartache of it. Eventually, I said yes, but it was difficult to do." Looking back, she wishes they'd made their peace with each other before appearing on the show. "We were silly, because we didn't meet up at all before the cameras were on us, and you can see that atmosphere - the tension is very awkward and very uncomfortable on camera," Edele said. "We weren't really prepared for what was to come: They really dredged up the stuff that we never spoke of at the time, and managed to pull the drama out of it. It was pretty intense, but that's reality TV for you." Intense it was, as the quartet tearfully worked through lingering resentments in meetings that looked more like group therapy sessions. But the therapy worked: Buoyed by the success of an initial Big Reunion concert, B*witched have toured steadily since, even releasing an EP of new material in 2014. B*witched are now part of a spate of '90s pop acts enjoying a second life: cheese merchants Steps and uber-cool girl group All Saints both tour and release new music, delighting fans who never stopped loving them. But while many bands say they're able to enjoy the experience more second time around, Edele was typically honest about the difficulty of life in B*witched, now all four members are mothers approaching middle age. "We have been writing a new album we want to put out for our 20th anniversary. It just hasn't worked out yet - it's so hard to schedule mothers. Four mothers being in a band! It's a nightmare. We find it incredibly hard to do a lot of things," she sighed. It's one reason, she said, why a long-hyped reunion from those titans of '90s pop, the Spice Girls, is yet to eventuate. "We just saw Melanie C a couple of days ago, and I was talking to her about it. They've obviously talked about coming back and doing a tour - she was like, 'We do want to do it, but it's really hard to figure it out.' Hopefully they'll get there in the end. "They've got one plan, and they're trying to make it work logistically, but Victoria's incredibly busy, Mel (B) lives in LA … I hope they come back. I'd like to see them together again." B*witched play So Pop: The Ultimate Pop Concert across Australia and New Zealand, January - February 2019. Also on the line-up: Aqua, Vengaboys, Blue, Eiffel 65, Lou Bega, The Outhere Brothers, 2 Unlimited and Mr President.